The King of Hearts Express is a lightweight, easy-to-use cardiac event monitor. The Express features 300 seconds (five minutes) of EKG memory and programmable features that allow it to be adapted to every patient’s monitoring needs. In addition, patients have the option to wear the monitor on their waists as they would a pager, in their shirt pockets or around their necks on a cord. This will ensure that patient comfort is maximized. This unit requires electrodes to capture pre-symptom EKG. To record an event, the patient presses the RECORD button. To transmit the event, the patient dials the toll-free FCM Receiving Center: 1-800-274-5399. The Receiving Center is open 24-hours a day, 365 days a year. 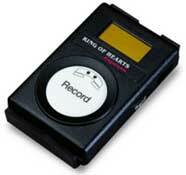 The King of Hearts Express is placed over the mouthpiece of the phone to transmit the stored EKG for analysis.